Low profile designs. Two-part cases assembled with self-tapping screws. Screw bosses for PCB’s in top and base sections. Great for desk top or wall-mounting. 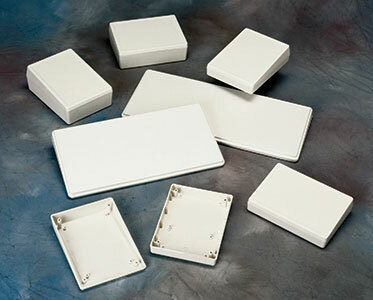 Recessed area and insert tooling offer additional flexibility. Version 1 – Control area recessed by 0.03″ fir membrane keyoads. Version2 – Top surface has custom insert area for molded in cut outs. 5.43" x 7.48" x 2.09"/1.24"
7.48" x 5.43" x 1.85"/1.24"
14.57" x 7.28" x 1.48"
17.56" x 7.48" x 1.50"